Forrest Road Medical Centre has served the Padbury community since 2004. 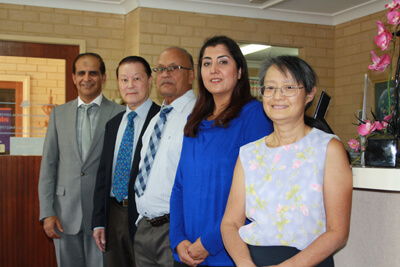 Dr Shahab Taj MBBS (UWA), ACRRM has taken over the practice as clinic director, bringing over a decade of intense hospital and medical practice experience to those he serves. Our healing center offers technologically advanced diagnostic and treatment options, along with the care and compassion that every patient deserves. We provide outstanding service to locals and tourists alike, and pride ourselves on our family-friendly hospitality. Our medical clinic is family-focused and patient-centred. Nothing brings us greater joy than the relationships we’ve built over the years; our passion lies in helping to provide families with healthier, happier lives. We accept patients of all ages and genders and from every walk of life. Parents with young children, teenagers and the elderly are some of our favorite practice members, as well as athletes and those looking to maximise their health as they age. We can help with almost every disease and condition: from ingrown toenails and skin cancers to sports injuries and chronic, debilitating pain and dysfunction. Whatever the problem, we’re here for you. Our patients have complete access to our many services, and our talented and experienced staff of doctors give insight and perspective on the choices available. Whether you require the best in prenatal care or need help with mental health or sports performance, we have the tools and expertise to make a significant difference in your life. We feel fortunate to be part of the lives of so many people that place a high value on their health and wellbeing. Whether you’re in acute pain, or need help in managing a persistent problem, you can count on our help and understanding.